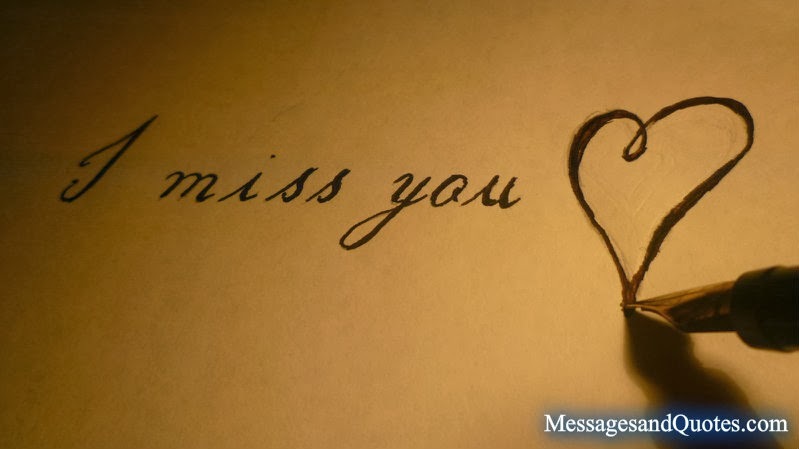 here are some Missing you messages and quotes to share your exact feelings. On a silent night when friends are few I close my eyes and think of you a silent night, a silent tear, a silent wish that you were here. As days go by, my feelings get stronger, to be in your arms. Look into my eyes and will see that its true, day and night my thoughts are of you. You may miss me, you may ignore me, you may even forget me but one day if you wanna see me do not search, just see your shadow I will be there trust me. I might not say it often but I want you to know that there is nothing more special to me in this world den having you by my side always.. Thinking of you. When you are alone, remember me, I am waiting for you. When you can not smile, trust me I can make you laugh. But when you are in a crowd of friends remember, I am alone. Frequency of my messages may be less..But the time I remember you is more. That is why science says that frequency is inversely proportional to time. People say it is difficult to wait for sum1,people say it is difficult to forget sum1,most difficult is to decide whether to wait for someone are to forget. You may be out of my sight....But never out of my mind........I miss you. I am in casualty now, do not say I did not tell you. After 5 minutes, I will be transferred to icu. Doctor told, I will die if I don't stop....Missing you. I am going to write on all the bricks I miss you, and I wish that each one fall on your head, so that you know how it hurts, when you miss someone special. Remember the good times we had spent together, and the beautiful future we had dreamed, I never wanted to create a distance between us ..I miss you. As I look back in my life, I remember tears I cried, jokes I laughed at, things lost and missed by, but there is one thing I will never regret day we met. Thought for the lifetime, a good relation does not depends on how good understanding we have. But it depends on hw better we avoid misunderstandings. Miss u. It is easy to pretend a smile, but hard to hold back tears. It is easy to say I do not miss you, but it is hard to accept it. It is easy to say bye, but it is hard to go away. They say its painful to wait for someone, they say it is painful to forget someone, but the worst pain comes when you don't know whether to wait are forget. I miss you so much I miss you like crazy when we are not together I become so lazy....I miss you my dear. Miss me with every breath you take, miss me with any dream and plan you make, miss me with every wish that come true, miss me like. I am missing you. Missing someone when you are alone is not affection. But thinking of someone even when you are busy is called real addiction. It is hard to say hello because it might be goodbye. It is hard to say I am okay because sometimes I am not. But it is easy to say I miss you because I really do. Whenever I miss you, stars falls down from the sky, so any day, if you find the sky empty don't blame me. It is your fault, you make me miss you so much.. I m going to write on all the bricks I miss you and I wish that one falls on your head, so that you knows how it hurts when you miss someone special like you. Whenever you miss someone..look at the sky..although you might not see the person there..but feel happy that you two are under the same sky. The pain is not on the day of missing our dear ones, the pain is really when you live without them and with their presence in your mind. I miss the touch that comforts me in times of despair. I miss every part of a sec I spent with you, I miss the beautiful eyes that I can sail through. Do you think you are the 1, that I can not live without you. Well, if you think that I think about you so much and I miss you always, then you are absolutely correct. My heart is missing you and I wonder... Do you miss me too? I hope that you do, because I know I miss you. For every day I miss you, for every hour I need you, for every minute I think about you. I miss your warm eyes, the way you listen and care. I miss your kisses and all that we share miss you dear. To forget is heard to do, and to forget me is upto you, forget me forget me never, forget the text but not the sender. Miss you a lot. Do you know, what I say, what I think, what I feel, what I wish, you want to know? I miss you so much. Close your eyes, relax you are breathing as long as you can now breath I miss you as much as you missed the air. Today I miss you yesterday I missed you. Don't worry about tomorrow, I will always miss you, and that is a promise. Miss you forever. Can you keep a secret between me you promise I really need to tell you this well I miss you. I would write on all the bricks I miss you and hope that one falls on your head so you know how it hurts to miss someone special like you. I miss you. I miss all of the caring things you do, and spending the evening alone with you. I miss the touch of your hand, so reassuring and sincere, and the moments we spend together, that I hold dear. So many questions, but the answers are so few, all I really know is, I miss you.